Get a really good colour on the bones as they give a good flavour to the soup. This stock has multiple uses and freezes very well. I would use to make an amazing risotto or pasta dishes. Begin by roasting off the fish bones until well coloured, reserve on the side. In a large pan sweat down the vegetables with the saffron and star anise, paprika until soft with no colour. Add the tomatoes and tomato puree and cook down slowly till all the moisture has gone. Add the wine and Pernod and reduce until thick then add the fish bones to the soup. Add the stock and bring to the boil, skim and cook out gently for 1 hour. When cooked puree the soup in a blender until smooth. Pass first through a coarse sieve first then twice through a fine chinoix. To adjust you may need to let down with a little stock, then add salt and a little more Pernod and some extra virgin olive oil. 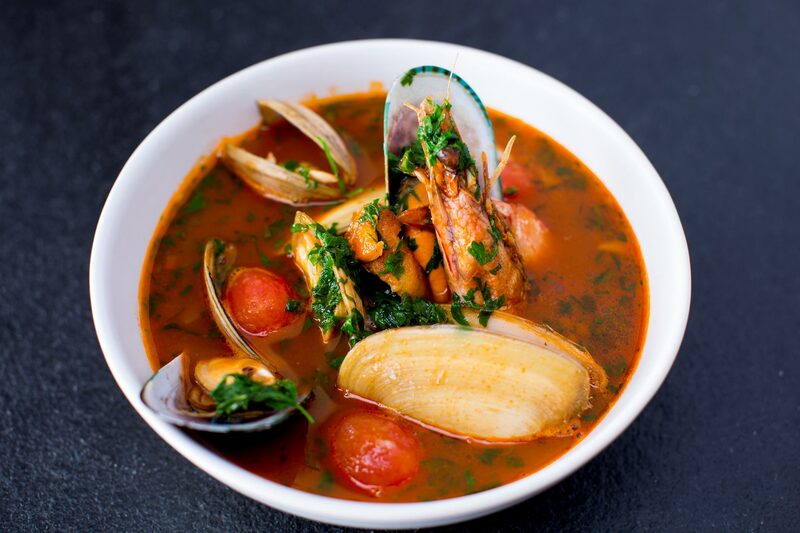 To finish take a medium pot and heat, add a touch of olive oil then the washed clams and mussels then cook with a lid on for 30 seconds, then add the trevally, prawns and the tomatoes, cover with 500ml of soup and bring to a simmer until all ingredients are cooked through. Finish with parsley and dill.